If you thought the rise of cloud computing spelled the end for the mainframe, think again. IBM announced Tuesday its new z13 mainframe, a system that took over five years to develop and which Big Blue says will be available in the first quarter of 2015. The new machines are tailored to meet the “the massive growth of the mobile commerce,” said Mike Gilfix an IBM director of enterprise mobile and can supposedly process process 2.5 billion transactions a day, which [company]IBM[/company] equates to one hundred Cyber Mondays. 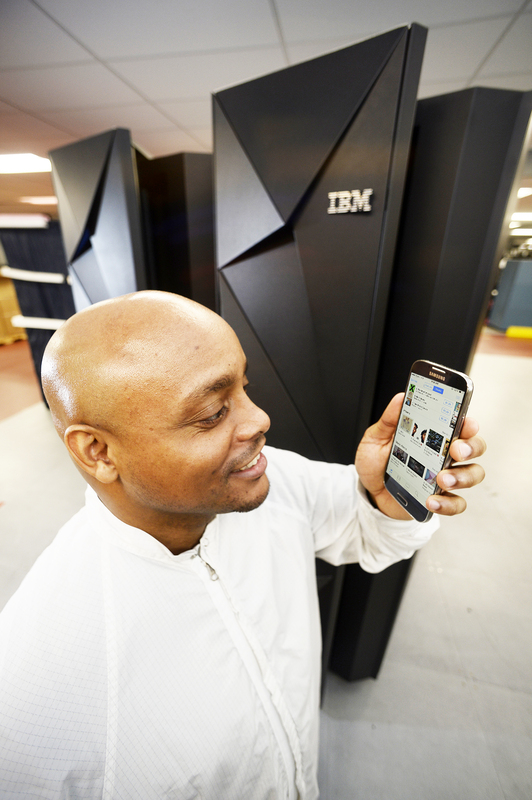 It’s clear that companies that specialize in financial transactions and commerce are the customer targets that IBM is eyeing with these machines, Gilfix said, as these organizations have typically been the “bread and butter” clientele for mainframes. Companies that specialize in logistics, like the airline industry, are also potential customers of these machines. With more people using mobile apps to send payments or do their online banking, the financial industry is now dealing with enormous amounts of data streaming into their backend than ever before, explained Gilfix. The new machines can supposedly handle the flood of traffic sent from mobile devices and can encrypt those transactions in real-time; this emphasis on security is something that distinguishes these big iron machines from the cloud. IBM’s in-memory database DB2 is also included in the z13 mainframe, which Gilfix said helps boost the speed of queries. And if you wanted to use one of these machines in your own private cloud setup, the machines also supports [company]OpenStack[/company] and Linux. This is helpful if you’re a company looking for one piece of hardware to setup up cloud infrastructure as opposed to procuring multiple pieces of equipment like networking gear and storage devices and having to tether those parts together. “If your definition of cloud is that you can run large-scale virtualized workloads, then you can absolutely use the mainframe to do that,” said Gilfix. â€œ’If your definition of cloud is that you can run large-scale virtualized workloads, then you can absolutely use the mainframe to do that,’ said Gilfix.” What an odd bit of PR non-speak. If your definition of is that you can run large-scale virtualized workloads, then you can absolutely use the mainframe to do that. If your definition of is that you can run large-scale virtualized workloads, then you can absolutely use the mainframe to do that. So what? Anyway, aren’t the resources that the workloads use for service the part that might be virtualized, not the workloads themselves? Does anyone from IBM engineering review this stuff? â€œâ€™If your definition of cloud is that you can run large-scale virtualized workloads, then you can absolutely use the mainframe to do that,â€™ said Gilfix.â€ What an odd bit of PR non-speak. If your definition of a classic data center is that you can run large-scale virtualized workloads, then you can absolutely use the mainframe to do that. If your definition of running at co-lo is that you can run large-scale virtualized workloads, then you can absolutely use the mainframe to do that. So what? Anyway, arenâ€™t the resources that the workloads use for service the part that might be virtualized, not the workloads themselves? Does anyone from IBM engineering review this stuff?